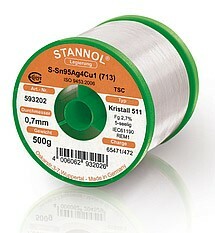 Innovative flux and a high qualty alloy provide to Stannol Kristall 511 solder wire excellent processing properties with a minimum of clean transprarent residues. This is an archive article published 24.07.2015. Some information may no longer be up to date and in line with the current state. Please contact us in case of interest. You, who are at production of electronic devices, know, how important is a choice of a suitable solder. A designer of a given device might not focus on a solder used at soldering of the first protoype, bu tin a production it will manifest itself – sooner or later. Not that some solder would be miraculous and otherone unusable, but each one is suitable for something else. Similarly lie in other segments, even here are some exceptions, when by using the newest materials and know-how from development of solders exist types suitable for multiple applications. One of them is solder Kristall511 Ecoloy with an innovative flux based on synthetic resins. The result is a small spatter and clean, transparent residues, which don´t influence electrical properties of a PCB, i.e. they belong to a "No clean" category – they can stay on a PCB withot cleaning. Kristall 511 is a considerably active solder and it shows its strength even at surfaces with not that optimal solderability and also there, where it´s necessary to solder quickly (for example components that are exceptionally sensitive to temperature). KRISTALL 511 was developed for automated soldering of SMT components, as well as for hand soldering and rework. On stock we have two novelties KRISTALL 511 Sn95,5Ag3,8Cu0,7 (593132) (diameter 1mm, 500g) and KRISTALL 511 Sn96,5Ag3,0Cu0,5 (810050) (diameter 1mm, 500g) solder wires. Technical details can be found in the Kristall_511 datasheet. Naturally, the best and the only way to find out a suitability of a given solder is to try it in praxis. That´s why we keep in stock several versions of modern solders. Should you be interested in some other type, please let us know. We´re always ready to listen to your requirements at address info@soselectronic.com.